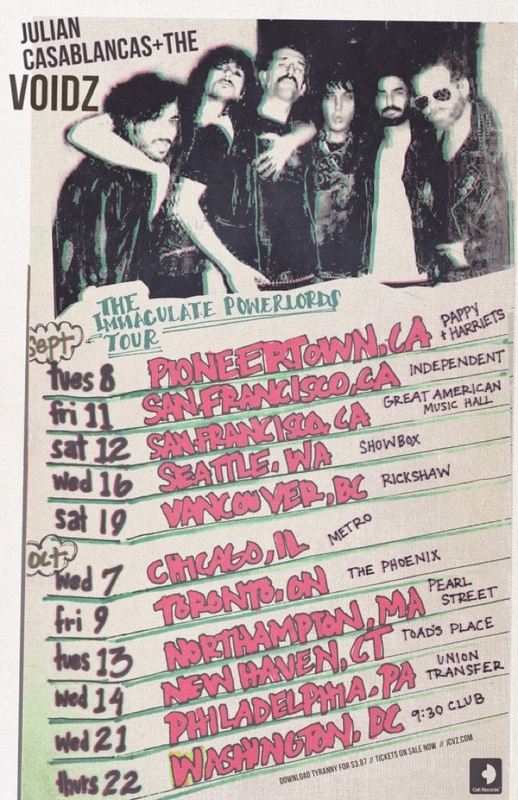 Following the release of last year's Tyranny, Julian Casablancas + the Voidz recently announced plans for an "Immaculate Powerlords Tour." Unfortunately, things have ended up to be neither immaculate nor, er, powerlordy, as the band have just cancelled their entire North American tour. The trek, which included Canadian stops in Vancouver and Toronto, was cancelled in full with a press release, where the group explained that they were too ambitious with the stage setup for the tour. Though they're rather cryptic about it all, they explained that production elements simply didn't come together in time. They signed the statement as "humbleLords." Read the band's full statement below, then weep over the fully cancelled tour itinerary. With great regret, we need to cancel our upcoming shows in North America. We had set out to do something a bit different with these shows and create more of an experience that would be inspiring to our fans as well as to the band. In order to make this work we needed many pieces to fall into place that just didn't. Everyone will of course be given a full refund. We are going to regroup and re-approach this in the way it was intended, and soon.